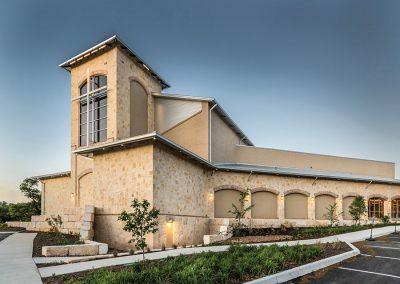 The new Oak Hills Church in San Antonio, Texas, is a blend of contemporary and traditional Hill Country designs. 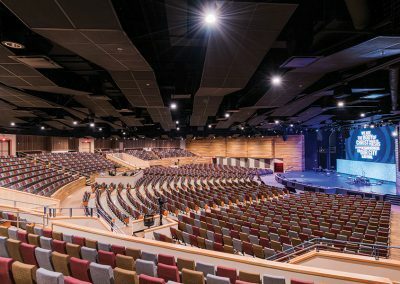 Begun in August of 2015, the project consisted of a remodel of the existing 115,000-sq.-ft. facility and construction of a new 60,000-sq.-ft. auditorium large enough to accommodate 2,600 worshippers at a time. 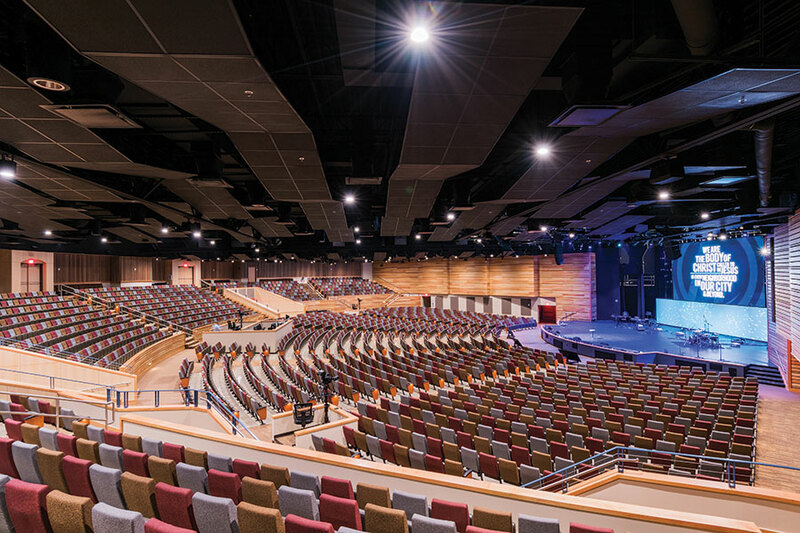 With space for 2,600 worshippers, the auditorium is large enough to accommodate large crowds, yet feels intimate, warm and inviting. 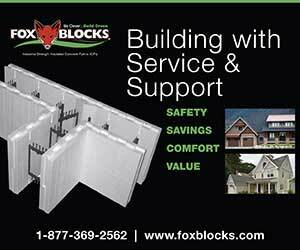 The structural engineer drew up two options, one with structural steel and the other using ICFs. 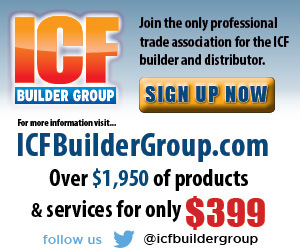 When the bids came back, the ICF model was both the most economical and fastest solution. 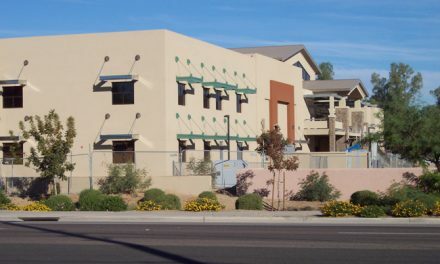 The foam-and-concrete building method exceeded the energy requirements and provided plenty of strength to support the long roof spans. They also helped eliminate outside noise, which was another factor the church prioritized due to the freeway location. 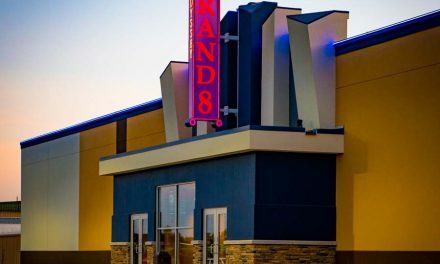 “By using ICF walls for the majority of the exterior walls, we were able to almost double the required R-Value to help reduce energy usage,” says Luetkenhaus. 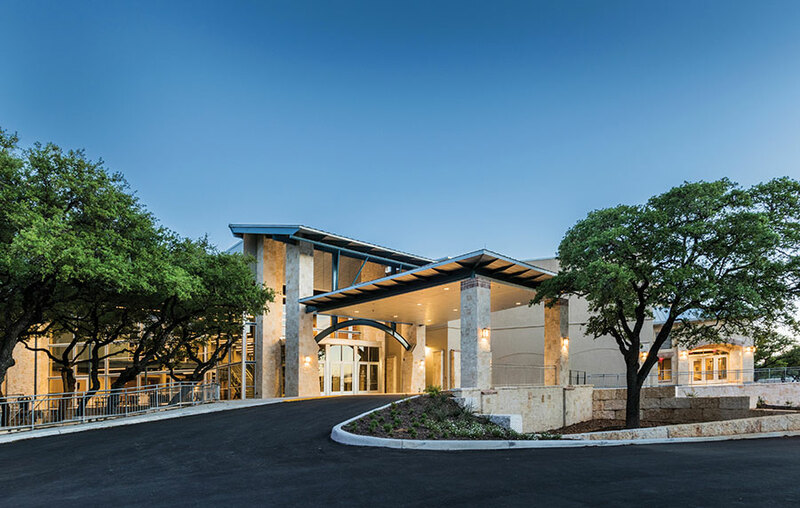 The building also has all LED light fixtures and occupancy sensors to manage lighting. 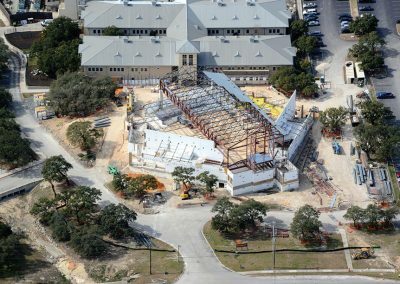 Representatives from the church and design team interviewed several general contractors, and in the end SpawGlass, which had previously built a very large dormitory using Fox Block, was selected. 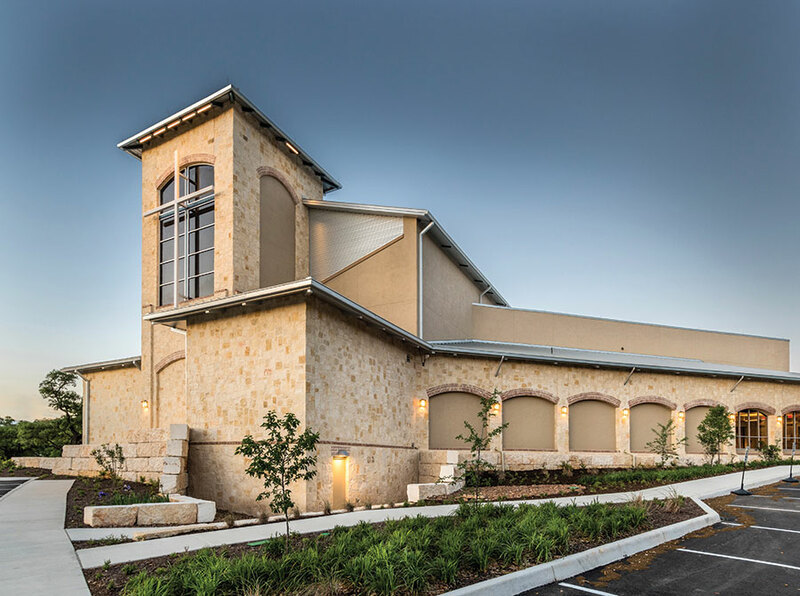 Despite the church’s complexity, they chose to self-perform the ICF install using the same brand, with 6-, 8-, and 12-inch cores being used throughout the project. 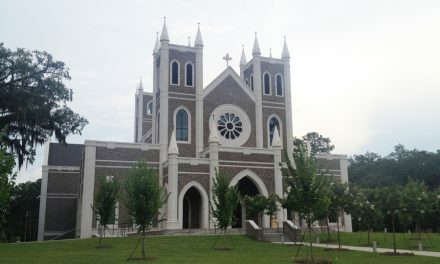 In total, the church used about 35,000 sq. ft. of forms, split almost evenly between interior and exterior walls. 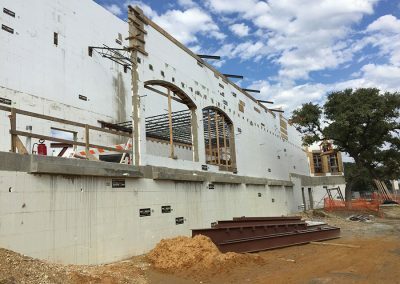 Luetkenhaus says, “We are not aware of another worship space of this size or complexity that uses ICF for both exterior and interior walls.” ICF was also used for fire wall separation, basement walls and retaining walls. 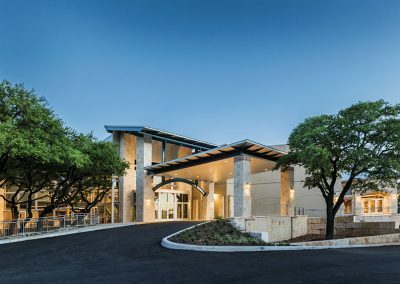 Designer Tony Luetkenhaus at RVK Architects, says, “One of the design challenges was to maintain the Hill Country style with a pitched metal roof over a fan-shaped footprint. As a solution, we divided the roof into three sections, with the middle section being a gable supported by two large trusses that were 12’ deep and 150’ long. The roof was only one of the challenges the builders faced. The design included 40 corners—several of which were non-standard angles—and 22 arched openings. 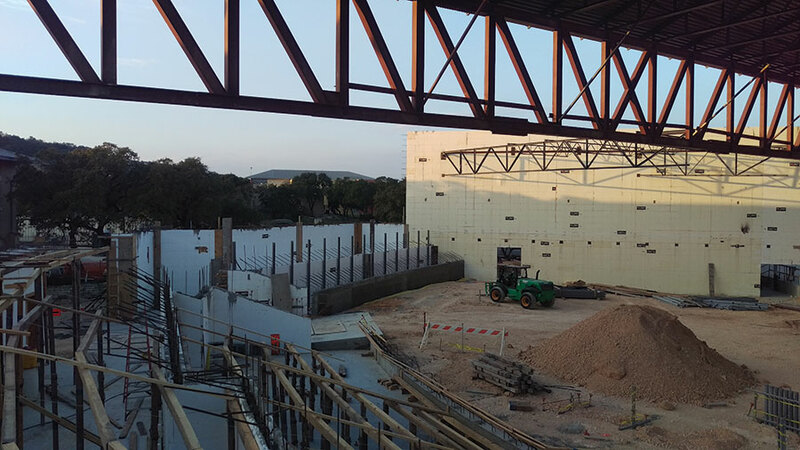 Load-bearing walls reached 35’ high, and the longest tall wall was an enormous radius that wrapped around the back of the new worship space. 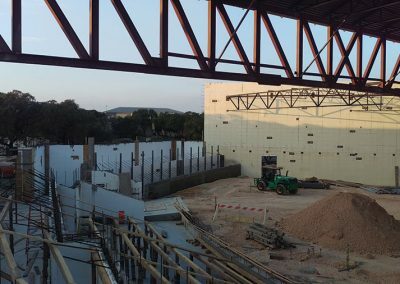 Girders, joists, beams and decks were all supported by the ICF walls or embed plates within them. Several very large plates were required for girder support. Steve Schulte, the jobsite superintendent with SpawGlass, reports the job went relatively smoothly. Once, they neglected to adequately reinforce the area around one of the large weld plates, where several of the surrounding cross ties had been cut. They quickly rebounded by installing plywood on the backside of the area that had cut cross ties. One innovative solution they developed was using the steel roof trusses to provide intermediate wall support, eliminating the necessity of temporary wall bracing as they went up. This method also kept walls plumb and straight. 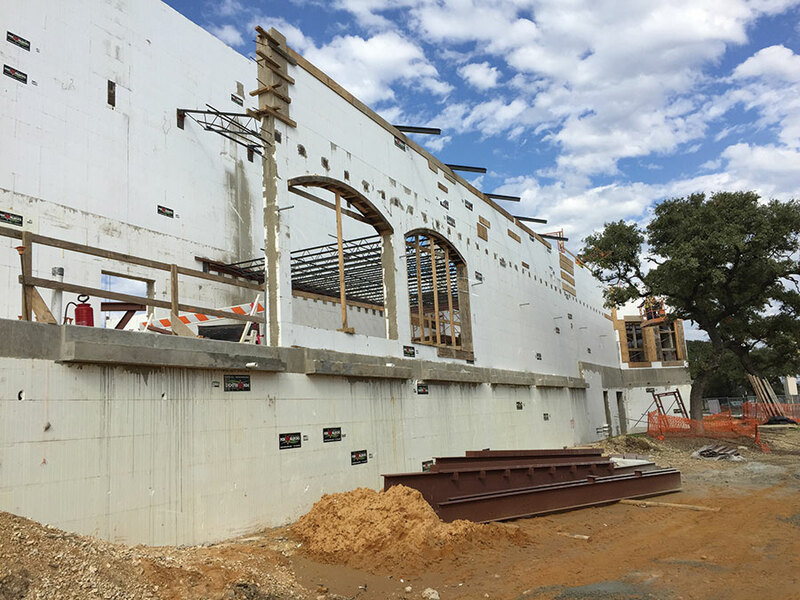 They also used a masonry hanging system by Halfen to hang masonry arches above the arched ICF window openings with great success. The finished worship space has a warm and intimate feel. Leutkenhaus says the feeling of intimacy was created by keeping the roof relatively low, and using warm colors and wood finishes. 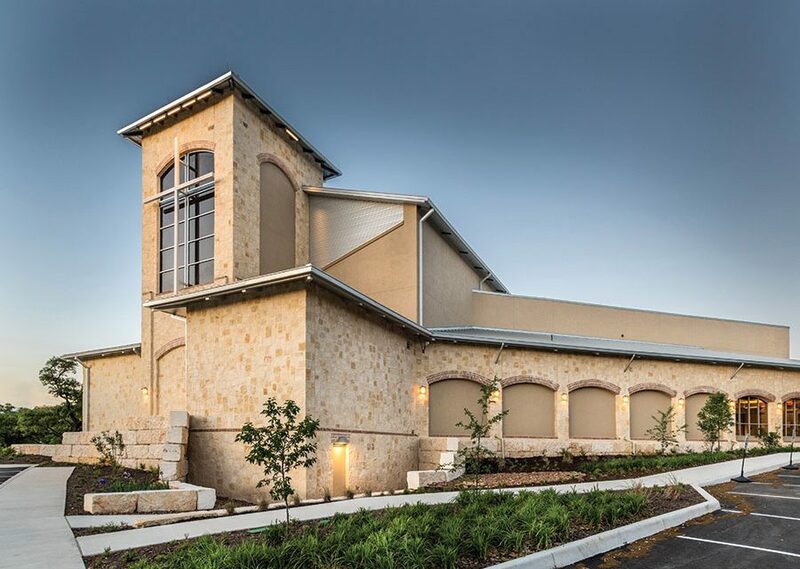 Excellence in Construction Award from the Associated Builders and Contractor, Inc., South Texas Chapter for the New Worship Space. Low ceilings, wood accents, and warm colors contribute to a cozy interior feel. 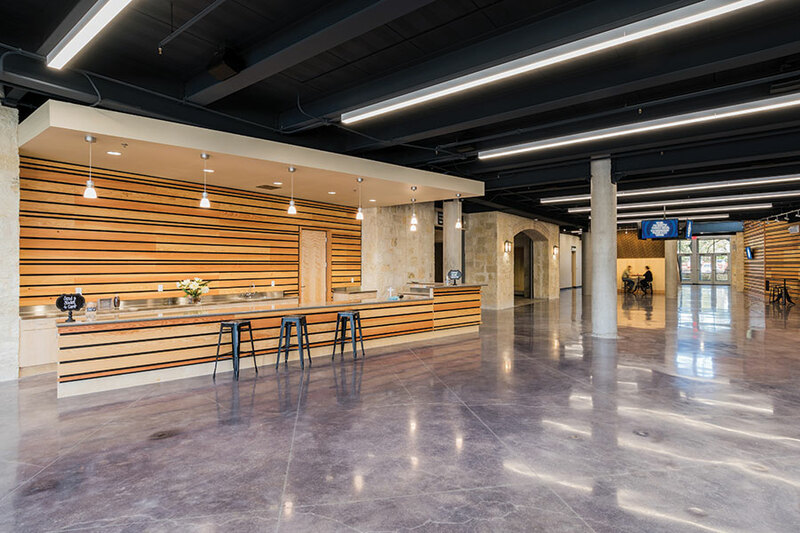 More importantly, the church is extremely satisfied with the result: a space large enough to worship, yet feels intimate, warm and inviting. 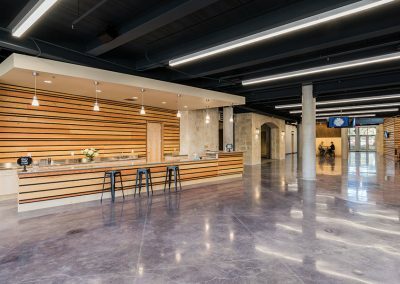 The project was completed on time and on budget, and the first services in the new worship space were held on Christmas Eve 2016. 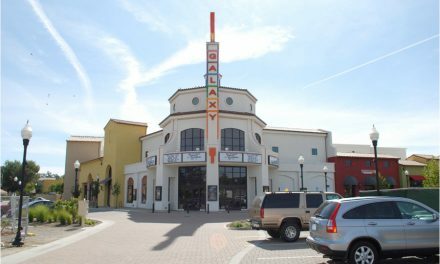 Three services were held to accommodate the congregation, with two of them at capacity and the third close to capacity. 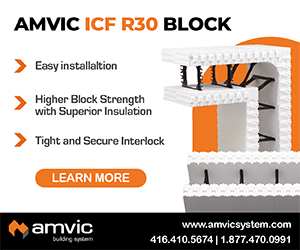 ICF Use: 34,710 sq. ft.